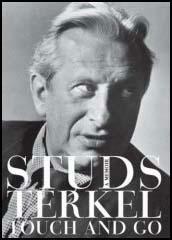 Louis (Studs) Terkel, the third son of Russian-Jewish parents, was born in the Bronx on 16th May, 1912. Eleven years later the family moved to Chicago where his father found work as a tailor. He later opened a rooming house for immigrants. After graduating from high school in 1928, Terkel went to the University of Chicago where he received a law degree in 1934. The following year he found work producing radio shows as part of the Federal Writers Project. Terkel, who now adopted the name Studs (after the hero in James Farrell's novel, Studs Lonigan), also became involved in the Chicago Repertory Theatre. In 1939 he married the social worker Ida Goldberg. The marriage was to last for 60 years. On the outbreak of the Second World War Terkel attempted to join the army but was rejected because of a perforated eardrum. He joined the Red Cross but he was not allowed to serve overseas. He later discovered that this was because of his left-wing political views. During the 1940s Terkel became a familiar voice on radio working as a news commentator and disc jockey. He also acted and appeared on several television programmes. In 1949 Terkel began his own television show, Studs' Place, an improvised sitcom where he played himself as a restaurant owner. After being investigated by Joseph McCarthy and the House Un-American Activities Committee in 1953, his contract was cancelled. Terkel refused to give evidence against other left-wing activists and was therefore blacklisted and prevented from appearing on television. He later recalled: "I was blacklisted because I took certain positions on things and never retracted... I signed many petitions that were for unfashionable causes and never retracted." Terkel eventually found employment with the Chicago Sunday Times where he wrote a regular jazz column. He also acted in various plays including John Steinbeck's Of Mice and Men. In 1958 he started his long-running daily radio programme on WFMT, the Studs Terkel Show. Ed Vulliamy pointed out: "As you listen, you know in your bones that each person has never told their story as cogently or as fully before and will never do so again, for that was Terkel's art. He was maestro of that most precious craft in the practice of both journalism and history: listening... But this distinction did much more for the archives of history than bequeath unrepeatable recordings of the great, the good and the gregarious. Terkel's obsessive interest in the propulsion of people's lives was at its most curious and passionate � and his subjects at their most brilliantly articulate � when he was dealing with everyday people, from whatever background: carpenters, judges, hub-cap fitters, priests, admirals, sharecroppers, models, signalmen, tennis players, war veterans and cooks." Other books in the same style by Terkel include American Dreams: Lost and Found (1980), the Pulitzer Prize winning The Good War (1985), Chicago (1987), The Great Divide (1988), Race (1992), Coming of Age (1995), Talking to Myself: A Memoir of My Times (1995), My American Century(1998). Will the Circle be Unbroken?, a book about death, was published in 2001. This was followed by Hope Dies Last (2005), And They All Sang (2006), They All Sang (2007) and Touch and Go: A Memoir (2008). Terkel has been described as a historian and a sociologist but he prefers to call himself a "guerrilla journalist with a tape recorder". He created controversy when Tony Blair resigned and he asked: "Why was he such a house-boy for Bush?" 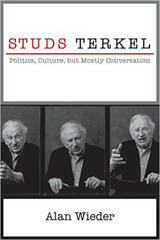 Studs Terkel died in his Chicago home on 31st October, 2008 at the age of ninety-six. He asked that his epitaph should be: "Curiosity did not kill this cat." By John Simkin (john@spartacus-educational.com) © September 1997 (updated September 2016). (1) In an interview he gave in 2002, Studs Terkel explained how was blacklisted in 1953. A man comes from New York. He says, "These petitions, your name is on all of them: anti-poll tax, anti-lynching, friendship with the Soviet Union.... don't you know the communists were behind them?" And he said, "Look, you can get out of this pretty easy. All you got to do is say the communists duped you. You were dumb. You didn't mean it." I said, "But I did mean it!" To this day people say, "Oh, Studs, you were so heroic." Heroic? I was scared shitless! But my ego was at stake. My vanity. "Whaddya mean, I'm dumb?" (2) Studs Terkel, interviewed by Kira Albin in 1996. Studs Terkel likes to illustrate his point with a poem by Bertold Brecht: . "When the Chinese Wall was built, where'd the masons go for lunch? When Caesar conquered Gaul, was there not even a cook in the army? When the Armada sank, King Philip wept. Were there no other tears?" The history of those who shed those other tears, the history of those anonymous millions, is what Terkel wants readers and listeners to come away with. "What's it like to be that goofy little soldier, scared stiff, with his bayonet aimed at Christ? What's it like to have been a woman in a defense-plant job during World War II? What's it like to be a kid at the front lines? It's all funny and tragic at the same time," says Terkel. There is an urgency in preserving history, Studs' style. "Think of what's stored in an 80- or a 90-year-old mind. Just marvel at it. You've got to get out this information, this knowledge, because you've got something to pass on. There'll be nobody like you ever again. Make the most of every molecule you've got as long as you've got a second to go." For the first book, I interviewed one mother of four little kids, skinny, pretty, bad teeth - meaning no dental care - and the kids are jumping around, because they want to hear their mamma's voice played back... and so I play it back, and she listens to what she said on the tape and she says, 'Oh my God,' she says. ' I never knew I felt that way before'. Terkel has built a career on the hunch that pretty much everyone might be worth trying to talk to: the rich and famous, certainly, and burglars and murderers and Ku Klux Klansmen - but most of all the teeming, unexamined mass of American life in between. Armed with a tape recorder, he has interviewed hundreds of people, producing a series of books that tell the story of the American century verbatim, and from the ground up: day-labourers, poor farmers and gangsters for Hard Times, his book about the Depression; everyone from steelworkers to hookers for Working, about the realities of employment in America; and his Pulitzer Prize-winning chronicle of the second world war, The Good War. They are the sound of a nation spontaneously unburdening itself to the first person who had thought to ask. Redemption, he says: that's what this book (Will the Circle be Unbroken?) and all the others are really about. His favourite interview was with CP Ellis, a former Ku Klux Klan leader who ended up fighting for the union rights of black janitors alongside his partner, an African-American woman. "Anybody can be redeemed. I've seen it." Terkel, who is 95, has long been a Chicago icon, every bit as accessible and integral to the cultural life of the Windy City as Susan Sontag was to New York. He had shared the bus stop with this couple for several mornings but they had always failed to acknowledge him. "It hurts my ego," he quips. "But this morning the bus was late and I thought, this is my chance." The rest of the story is his. "Well, he was scared and nervous and the bus was still late. I've got this guy pinned up against the mailbox. He couldn't get away. 'How many days a week do you work?' I went on. Well, then the bus came and I never saw them again. But I think that every workday morning she was looking from the 15th floor of their apartment block to see if that mad man was still there." His speaking style owes more to jazz improvisation than classical (very loud jazz improv as he is quite deaf). He goes where the stories take him. And if you're prepared to go with him, it is quite good fun. His book is written just as he speaks - an anecdotal pot-pourri. In conversation, he may mention famous people, such as the late Mahalia Jackson, who was the first gospel singer to perform at the Carnegie Hall and sang at both the March on Washington and John F Kennedy's inauguration. She refused to let a McCarthyite enforcer intimidate Terkel off her radio show at CBS. But he is just as likely to tell stories involving everyday characters he met along the way. Like "one-arm" Charlie, who had no teeth and dipped his toast in milk to make something called "graveyard stew". As an aside, Terkel tells me that Charlie lost his teeth or his arm or both (it was not entirely clear) in the Seattle strike of 1919. Terkel mentions the strike as though it needs no explanation - I later discover that it was over postwar wage controls - and, if there is a theme to his new book, it is his frustration at America's historical illiteracy. Gore Vidal has branded the US the United States of Amnesia. Terkel characteristically goes one step further, calling it the United States of Alzheimer's. "We forgot what happened yesterday. We know all about Paris Hilton. We know about that. But what do we know about why we are there in Iraq?" At one point in his book, he asks: "Do I have to be 94 years old to remember these names? Are they otherwise erased from history?" People call Terkel's business "oral history", but it is more like the weaving of a fabulous verbal tapestry, the threads of which are human preoccupations. It is the rich art of taking the vernacular, and making it eternal. Such a process does not merely record the details that keep people's minds busy, it gives them value. Terkel harvested not only the most complete American history of this century, but the most compassionate. In a way, Terkel's story is best told through that of Hobart Foote. When one asked Terkel which of all 9,000 interviewees he valued most, the answer was this one, which made it into a book, Working (1974). Foote lived in a mobile home near the Illinois-Indiana state line with his wife, a Bible and little else but "the clangor of trains, Gary-to-Chicago bound". The area is a great mesh of railroad lines, criss-crossing the roads. And so Foote talks about the "train problem" he has getting to work, since his journey is punctuated by so many railway crossings and long waits for lumbering freight trains to pass, and if he arrives a minute after nine, he gets docked for the whole hour. And so Foote's drive to work is a daily adventure, driving at speed to a detailed but flexible system across the assault course of railway crossings, changing the route according to which train is late or on time, which crossing shut and which open. "It's a game you're playing," he tells Studs. "Catch this light at a certain time, and then you've got the next light. But if there's a train there, I take off down Cicero Avenue and watch those crossings. And if I make her okay, you've got a train just over on the Burnham line you gotta watch for. But it's generally fast ..."
Why does Terkel remember this especially? "Because it's a great suspense tale. An adventure thriller through the railroads every morning, so this man doesn't get docked for the whole hour. The principle is that ordinary people have extraordinary thoughts — I've always believed that — and that ordinary people can speak poetically. Also that no one else speaks like that and that there is no other person like that in the world." A native New Yorker who moved to Chicago as a child and came to embrace his adopted city, Terkel excelled at the art of the interview; his ability to draw people out to talk unselfconsciously and at length gave what he called his "memory books" their charm and feel of authenticity. It was a skill that many reporters might have envied, and yielded the kind of detail that was the very stuff of social history. Led by his gentle prodding, his interviewees reminisced about the mob wars of the Prohibition era, the horrors of jungle warfare, the despair of the great Depression and the soul-destroying tedium of life on the production line. For his oral histories Terkel interviewed his subjects on tape, then transcribed and sifted. "What first comes out of an interview are tons of ore; you have to get that gold dust in your hands," he wrote. "Now, how does it become a necklace or a ring or a gold watch? You have to get the form; you have to mould the gold dust." Terkel was also a syndicated radio talk show host, interviewing many famous Americans, among them Martin Luther King, Billie Holliday, Louis Armstrong, Buster Keaton, Marlon Brando and Bob Dylan. His interview with the author James Baldwin in September 1962 was selected for the National Recording Registry of sound recordings by the Library of Congress. In his autobiography Talking To Myself (1986), Terkel reflected on his own Left-leaning politics, and recalled how the FBI had taken an interest in his links with people it considered subversive. It was on "Studs' Place," which was set in a tavern, that large numbers of people discovered what Terkel did best--talk and listen. Terkel, arms waving, words exploding in bursts, leaning close to his talking companions, didn't merely conduct interviews. He engaged in conversations. He was interested in what he was talking about and who he was talking to. But his TV career did not last. Terkel later complained that the commercialization of television forced his show, and the others in the "Chicago school," from the air. Also, at that time, McCarthyism was a potent force and Terkel was outspoken politically, with a highly liberal tone. "I was blacklisted because I took certain positions on things and never retracted," Terkel once said in an interview about those times. "I signed many petitions that were for unfashionable causes and never retracted." He had a hard time finding work, subsisting on small speaking fees and even smaller sums for writing book reviews. His wife, Ida, made enough to keep the family afloat. "The first time I saw her she was wearing a maroon dress," Terkel once recalled. "She made a lot more money than I did. It was like dating a CEO. I borrowed 20 bucks from her for our first date. I never paid her back." They were married July 2, 1939. Their only child, Dan, was born in 1949. "It was her self-assurance and strength that helped Studs accomplish as much as he has," said Sydney Lewis, a writer who was a friend and colleague of Terkel's for 30 years. "She was, on every level, his most important audience." In his oral histories, which he called guerrilla journalism, Mr. Terkel relied on his enthusiastic but gentle interviewing style to elicit, in rich detail, the experiences and thoughts of his fellow citizens. Over the decades, he developed a continuous narrative of great historic moments sounded by an American chorus in the native vernacular. “Division Street: America” (1966), his first best seller and the first in a triptych of tape- recorded works, explored the urban conflicts of the 1960s. Its success led to “Hard Times: An Oral History of the Great Depression” (1970) and “Working: People Talk About What They Do All Day and How They Feel About What They Do” (1974). Mr. Terkel’s book “ ‘The Good War’: An Oral History of World War II” won the 1985 Pulitzer Prize for nonfiction. In “Talking to Myself: A Memoir of My Times” (1977), Mr. Terkel turned the microphone on himself to produce an engaging memoir. In “Race: How Blacks and Whites Think and Feel About the American Obsession” (1992) and “Coming of Age: The Story of Our Century by Those Who’ve Lived It” (1995), he reached for his ever-present tape recorder for interviews on race relations in the United States and the experience of growing old. Mr. Terkel succeeded as an interviewer in part because he believed most people had something to say worth hearing. “The average American has an indigenous intelligence, a native wit,” he said. “It’s only a question of piquing that intelligence.” In “American Dreams: Lost and Found” (1980), he interviewed police officers and convicts, nurses and loggers, former slaves and former Ku Klux Klansmen — a typical crowd for Mr. Terkel.